I conceptualized and designed this board game solution for helping groups conduct effective brainstorming. Over a period of time in my career as a designer, brainstorming sessions have always been difficult to manage. The research for this project has been an ongoing journey as a designer where I had collected a lot of feedback from many brainstorming sessions I had conducted. What I had learned was that poorly structured sessions were the main reason for people leaving these sessions with a feeling of not having achieved their goal. So the strategy for this solution was to design something that will put an interactive structure around the brainstorming sessions. The process of designing the board game involved a lot of trial and error. I had to build many prototypes before we finally achieved our goal. Games make you leave your laptops and mobiles to huddle around the board. Serious gaming is fun yet productive. It helps you open your mind while doing serious tasks. 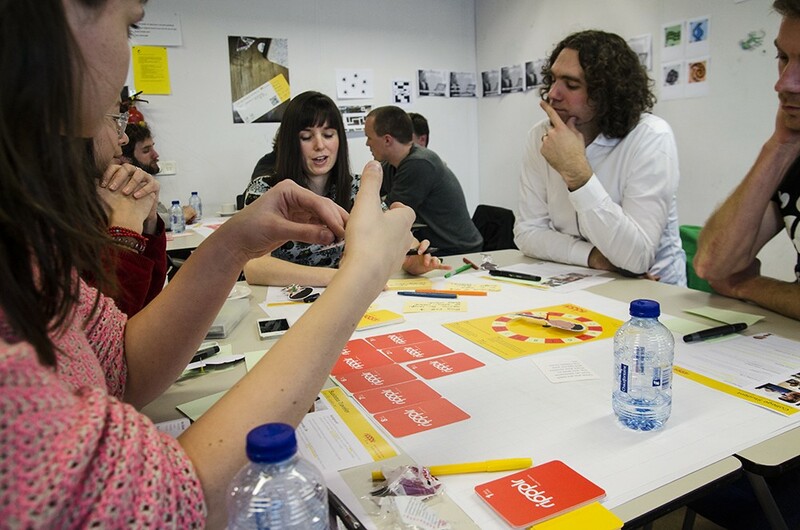 Role-playing helps bring real users to life on your design desk. Games help stimulate Creative Thinking in a playful manner. So, what’s wrong with the way we currently brainstorm? Usual suspects say the usual things. Brainstorming turns into a critique. Participants feel that “These ideas will anyways get killed”. How do you overcome these problems using a board game? Starting with right questions will lead you to the right answers. Spending a lot of time on one issue will lead to reduced focus. The game forces you to think fast. 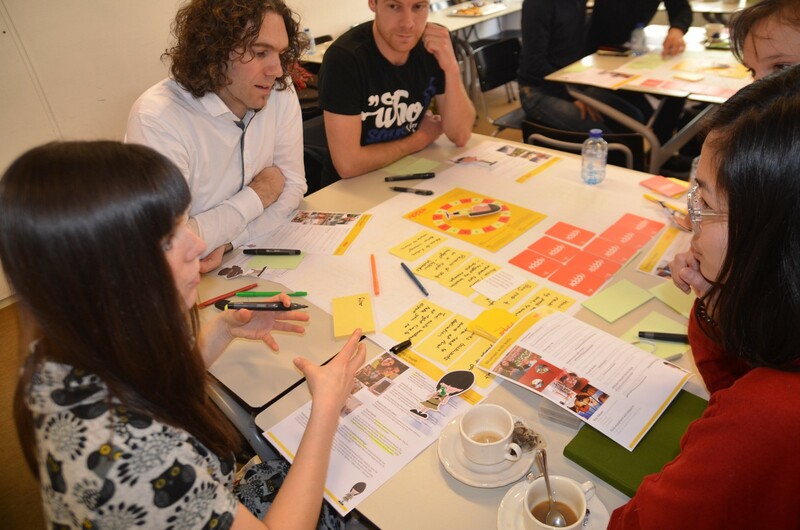 Cycling through personas quickly will keep the focus on the right questions. Planning and moderating the session by preparing issue cards leads to richer quality ideas. Adding edge cases through wildcards creates idea inversion or idea refinement. Roleplaying helps reinforce the users perspective. 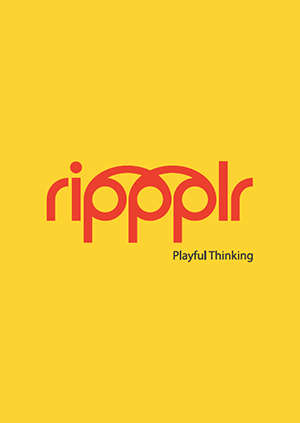 Rippplr helps in playful thinking and generating quantity and quality of ideas by putting everyone in the shoes of the users. RIPPPLR as a brainstorming tool can be adapted to any design process that is followed by you and can be used to efficiently generate ideas during the brainstorming sessions. Rippplr helps to make the brainstorming sessions, fun yet productive. Read the persona sheet prepared by the moderator. Choose one of the character design for their persona. (I will talk about this later). Moderator explains them how to imbibe the characteristics of the personas. 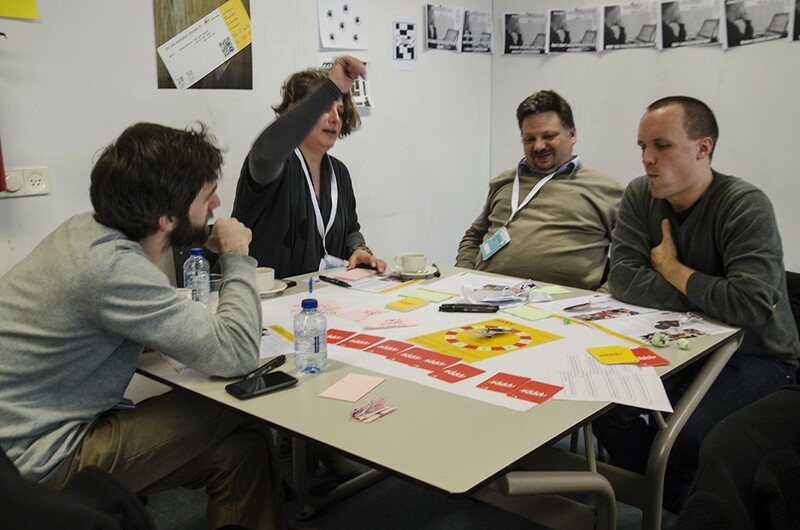 Later they go through a series of use-cases by shuffling through the issue cards and try to solve the problems with the user's mindset. 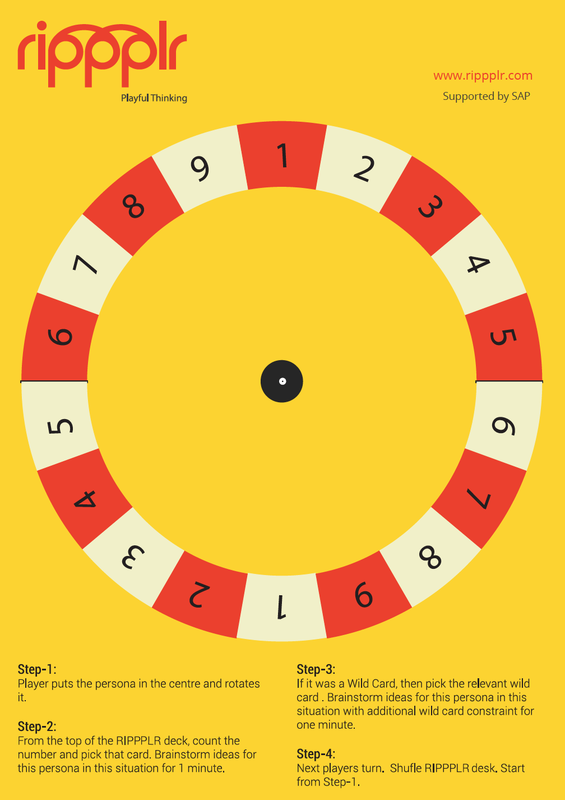 The board is an A4 size cardboard with a set of numbers in a circle. The center of the board has a place to put personas characters and rotate them on a pivot. The board also has some rules printed on the bottom to help everyone understand how to play. 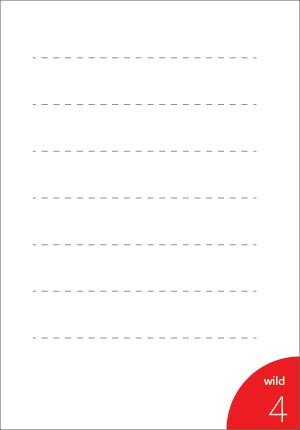 Issue cards have one use-case or an issue written on the back side. The moderator of the game or the project should carefully choose what to write on the back of these cards so that the discussion can stay focused and all use-cases get covered. Some of the issue cards are associated with a wild card. The reason for this is that for some of the use-cases, you may want to drill down a little further, or may want to flip those situations and see what kind of ideas can be generated. To do this, some issue cards have a number written on the right bottom corner to indicate they are associated with a particular wild card. As mentioned, the wild cards cover all the corner cases or edge cases that you want to bring to discussion during the brainstorming session. Usually, these issues are so much on the fringe of our memory that we usually end up not even touching upon these issues during typical brainstorming sessions. These cards help us in not forgetting about them. These are the key elements of the game. Each persona profile is cut out and handed to each participant. Each person in the group then has to imbibe the characteristics of this persona and try to do the role play while playing the game. This always helps keep the discussion focused from the point of view of the persona and the issues being discussed don’t become the participant's issues. Since the idea is to do the role play, everything they talk and say while playing the game has to be from the point of view of the persona. Playing Rippplr is the where the real fun begins. Firstly, since Rippplr is a brainstorming tool, it comes into use after the research phase of the project has been completed.So before playing the game, the users have to be informed about what the research findings have been so far (Primary as well as Secondary). There should also be a PoV (Point of View) for which you are trying to generate ideas at this moment. Once each participant in the group has understood the problem statement and also selected which persona they represent, they all start taking turns. The first person in the group has to place his/her persona in the middle of the board and give it a spin so that it starts rotating. When it stops, the user notes the number where it stopped and removes that many cards from the top of the issue cards deck and pics up the remaining topmost card. Now, everyone in the group starts thinking about this person in this situation and start to jot down ideas they can think of to help this person overcome that situation. They only get 2 minutes of time. Because the first few ideas that come to your mind are the most crucial ones. After the two minutes, the first person removes his character from the board and the second person places their character. If any issue card has a wildcard associated, then first the group does the two minutes brainstorming without looking at the wild card. After the two minutes are over, the wild card is opened and they get extra one minutes to think over this additional constraint. Like this, the game continues until the group feels that they have enough ideas on the table to proceed to the next phase of their design process.